Electricity systems can be considered in three independent parts – generation (converting energy to electricity), transmission (sending the electricity over long distances) and distribution (running power lines from local transformer stations to houses). In this infographic we illustrate the potential configurations of companies to meet these different electricity steps. Publicly or privately owned companies can and do enter any combination of these three markets. 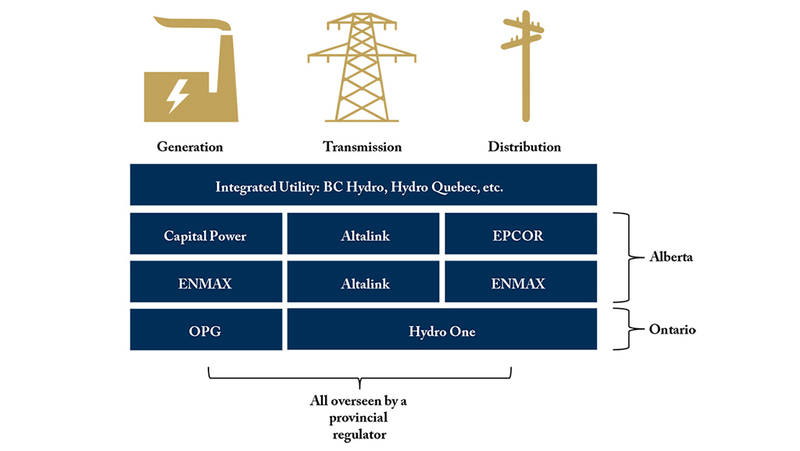 As the graphic shows, Canada has examples of companies focused solely on one segment, and on combinations of the three. Interestingly, the majority of Canadians, unlike many of their international peers, receive their electricity from government-owned electricity utilities. If provinces welcomed more private investment in electricity utilities, consumers would likely enjoy lower power bills. To learn more about the benefits of private investment in electricity utilities, read "Adding More Juice: How Private Investors can Improve the Performance of Provincial Power Assets."